Denmark #238A Small Pearls in Crown [1933 15 øre red Caravel, Engraved] (VF) on 12 June 1935 cover from "KØBENHAVN OMK" TO THE FAROES (Eide). 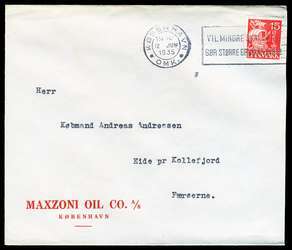 From the "Maxzoni Oil Co. A/S" -- the first oil company cover that I can recall seeing from Denmark to the Faroes that was not from the DDPA. Very fresh, neat and attractive. 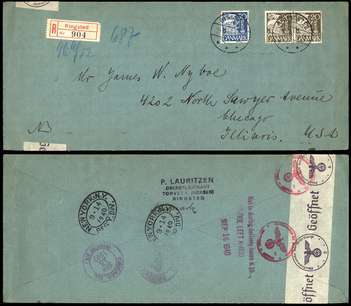 238C pair, 238F (F-VF) on March 1940 registered legal-size cover to U.S., from RINGSTED, with Nazi censorship.